Singaporeans earned higher incomes last year and unemploy-ment remained low, even amid uncertainties due to the changing global environment. They also saw improvements in bread-and-butter issues such as housing and healthcare. These were among the findings flagged in the Singapore Public Sector Outcomes Review, which takes stock of how Singapore has fared in key areas of national interest such as the economy and transport. The biennial report, released by the Ministry of Finance (MOF) yesterday, said that "Singapore is faced with fresh opportunities and new challenges as technologies reshape our economy and society". 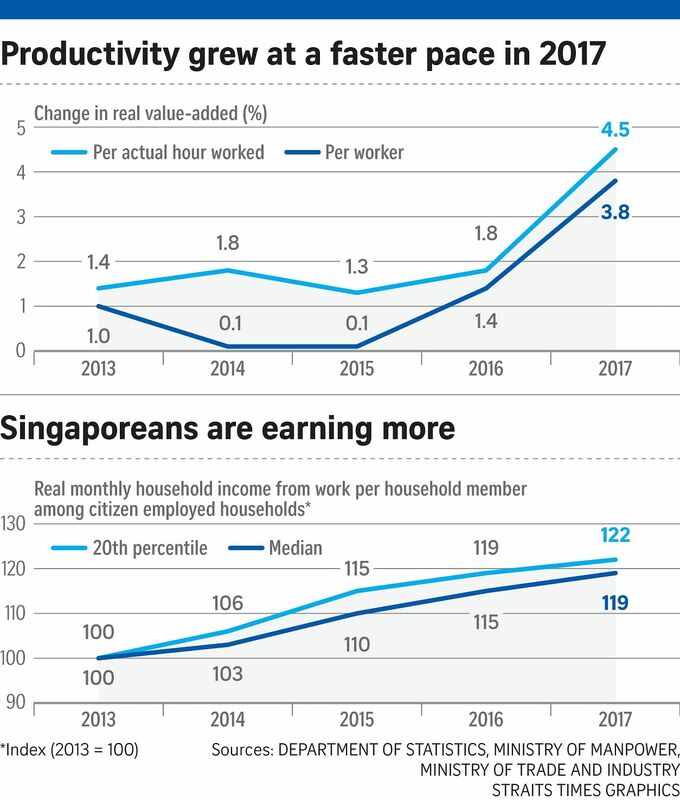 Even as the authorities continue to put in place measures to ensure that Singapore rises to the challenge, the report noted that the incomes of Singaporeans at the 20th percentile and median level both went up, with these wages growing by 4 per cent every year since 2013. And although unemployment rates were higher in 2016 and last year - crossing the 3 per cent mark - they remained low compared with other countries, the report said. The push for productivity - which is key to sustainable growth but has remained flat over the years - also saw results, even though gains are still uneven across sectors. Growth in real value-added per actual hour worked increased from 1.4 per cent in 2013 to 4.5 per cent last year, while growth in real value-added per worker picked up from 1 per cent to 3.8 per cent over the same period. All 23 Industry Transformation Maps to promote growth and competitiveness in sectors covering 80 per cent of the economy have also been rolled out, with MOF noting that the "next phase of transformation will look at synergies within clusters of industries". The report added that the Government's efforts in getting Singaporeans to embrace lifelong learning have also yielded fruit. The process of learning will start even before going to school, and extend beyond tertiary education. For example, two out of three pre-schoolers will have a place in an affordable government or government-supported pre-school by 2023. This follows a 60 per cent increase in pre-school spaces since 2012, with another 40,000 spots to be added. On the other end of the spectrum, more than 285,000 adult Singaporeans used their SkillsFuture credit last year. Also, overall training participation rate last year was 47.9 per cent - up from 35 per cent in 2015. The report also noted the various ways in which the authorities are helping to manage the cost of living. In terms of healthcare, government expenditure is expected to more than double, from $3.9 billion in the 2011 financial year to $10.2 billion this financial year. A large part of this is going towards enhancing subsidies. Last year, close to 90 per cent of bills for inpatient treatments required less than $500 out-of-pocket expenditure after subsidies and MediSave and MediShield Life. For outpatient treatments, about 750,000 and 650,000 individuals benefited from MediSave and the Community Health Assist Scheme, respectively. First-time buyers continue to have access to affordable homes, with the report noting that the debt servicing ratio of new four-room Housing Board flats in non-mature estates remained low at 22 per cent last year. Last year, 8,100 first-timer families and singles buying resale flats benefited from increased grants put in place since last February. As for transport, about 1.8 million concession cards, which give discounts of up to 50 per cent on regular adult public transport fares, have been issued to date. Those with disabilities also get subsidies of up to 80 per cent under the enhanced Taxi Subsidy Scheme, which now covers private-hire cars. Meanwhile, the needy continue to receive the largest share of transfers from the Government, with 79,000 beneficiaries receiving $131 million in social assistance payouts in the last financial year. The report also noted the push for better delivery of public services and more convenience to Singaporeans through the Smart Nation initiative. For example, businesses can now transact more easily with the Government through the LicenceOne portal, where a single form can be used to apply for multiple licences from 20 agencies. Singaporeans and businesses can now also make payments safely and simply through PayNow, for which around 1.76 million users have registered as of September this year. The authorities are also making use of this service to disburse payments like Edusave awards and SG Bonus payments more quickly. Commenting on the report, head of civil service Leo Yip said the Government has made progress on many fronts to deliver better policies and services. "One element that has been present across these efforts is ensuring we listen to and partner Singaporeans in these efforts - from transforming our economy to strengthening our society to ensure a better future for Singaporeans," he said.